We have ants in our kitchen. It is gross. I'm not talking a couple dozen ... I've killed several hundred (probably over a thousand) in the last two days. But really, what does it matter? My children, my husband and I are alive and healthy. Most of you that follow other special needs blogs are aware of the struggles of the Leong family at Chasing Rainbows. Kate (the bloggess mom) is almost always fantastically upbeat for the lot she has been dealt in life. But right now with her older son fighting for his life and the doctors not even sure if there is any brain activity she is struggling. She is actively begging for prayers so if you are at all religious, please take a moment to do just that. 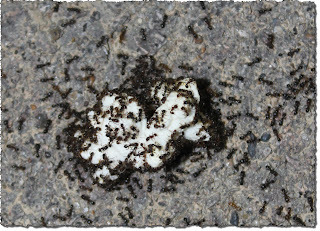 But back to the ants, the last time we had them was several years ago and they were in the basement by the cat's food. It was still gross, but it was the basement and it was the cat's food not ours. This time they are in the kitchen. I can't figure out where they are coming in but they are everywhere! But no, this is not really a picture of our kitchen floor. Tuesday morning Joe woke me up with, "Mom we've got ants in the kitchen!" and when I went in there I discovered them all over the floor near Alan's dropped food. OK, I should sweep that up every night but he drops so much so often that even with sweeping twice a day (or more) there is usually food on our kitchen floor! Then Tuesday afternoon I discovered them on the counter (grosser!) and swarming all over the cat's water bowl. Poor Diesel! I did my usual baby powder on every flat surface and they were still everywhere. Then a friend suggested Terro Ant Killer and I was a lady on a mission. I bought some of their bait stations yesterday and set them out and that got quite a few of them but not all. Today I am going out to buy the stuff that actually kills them. This morning Joe asked why I didn't just spray some bug spray. I tried to explain to him that you can't spray it in a kitchen because of the food. "Can't you just spray it everywhere else and not on the food?" Um, it isn't quite that simple. But while ants may be gross, they aren't life threatening. And back to the poor Leong family, little 5 year old Gavin is fighting for his life. I had read about Kate's struggles on Facebook and commented on FB and DH saw my comment and read her blog. He normally only reads mine and the ones I specifically ask him to read, but he read enough of hers to really sympathize. Then last night at bed he summed it up quite nicely, "It sure puts ants in perspective!" Yep, it does. Give those Terro traps a few days - they have to take the stuff back to the ant colony or whatever the hell and then it will work on all of them. I have had the same problem, down to my son dropping food EVERYWHERE, and you can't keep it clean enough! Good luck and thank you for the perspective. thanks for coming by the Show Off Blog Party! Ants aren't fun at all!!! I'm not sure what I did to get rid of them. I think I followed their trail and sprayed where it was at. However, I understand the food thing :(. I will also check out the Leong Family Blog and offer my prayers. Take care and hope to see you again next week! !